Changing behaviour for the better in schools. Mind map of strategies. I will endeavour to elaborate on this over the next few posts. These are strategies which do not reply on compliance from children…we change our own behaviours and actions first! Changing behaviour for the better in schools. I know of many schools that have problems with individual children whose behaviour does not meet the expected standard of the school. 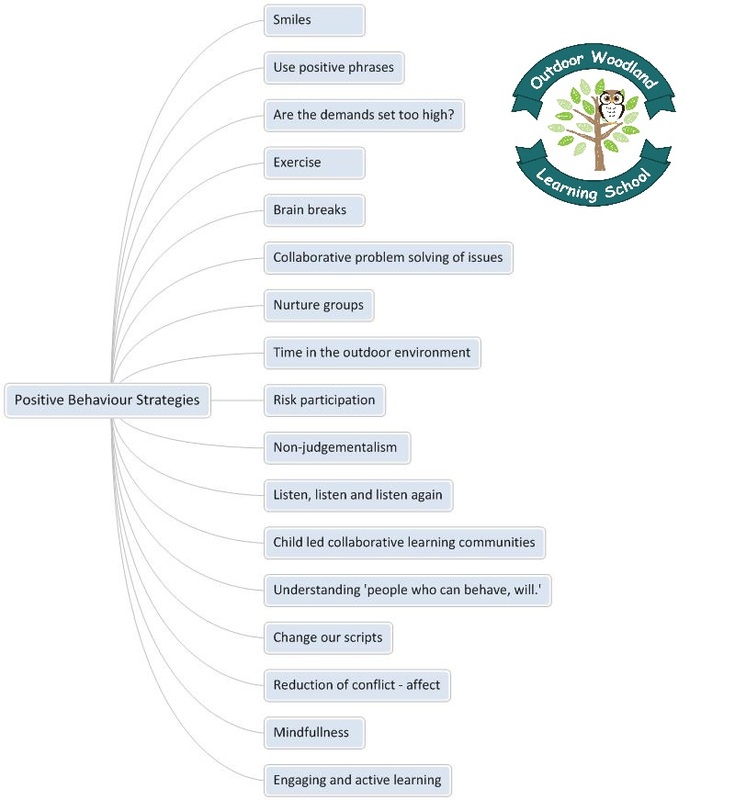 Having spent a lot of time thinking, reading and researching about this subject, and implementing strategies myself, I am feeling a little braver at sharing some suggestions in how to manage ‘unwanted’ behaviours and turn it into positive behaviour. What I will say as you embark on this journey of change, is that we do not always get it right. We do not succeed in everything every day, but if we do strive to change for the better, then change will happen! Now this does take time, you are not going to get a quick fix and it has to be tackled at three levels. It involves commitment and determination from teachers and other school staff, the senior management team and from parents. Note, the children are not involved in this process! It uses strategies that arise from thinking ‘out of the box’ so to speak and not the traditional behaviour management of using positive rewards and negative sanctions which require children to consciously change their behaviour. So how do we achieve the elixir of great behaviour in schools? Firstly, I would like you to think metaphorically and picture your favourite flower. Now think about why such a beautiful and perfect flower might fail to thrive and die? Did it have enough water? Was it over-watered? Was it planted in the correct type of soil? Did it get enough sunshine? Was it attacked by garden pests? Did it get a fungus or a virus? When a favourite flower fails to thrive as it should, we change the environment around the flower so it blooms. The same can be said for children in schools. We should look at changing the environment and not the child. 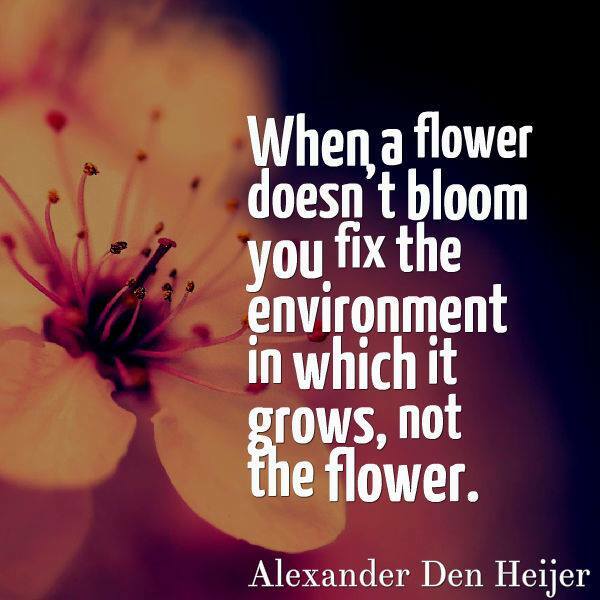 Now many schools are involved in creating better environments surrounding children, and this is especially pertinent to children with autism and other additional support for learning requirements. But once we have changed the physicalities, we often find that children still struggle. They still fail to thrive…so what can we do? Bo Hejlskov Elven, No Fighting, No Biting No Screaming. JKP, London 2010. In order for there to be a change in these negative behaviours, we must take responsibility to change the environment surrounding the child, including our own behaviours and ‘scripts’. As these positive changes occur, we will find those around us change for the better. And how to make this sustainable change? I have created a workshop on this topic and I will share some of the strategies I have learned over the next few posts. A lot of children I work with and support express their frustration in ways that are violent and dangerous to themselves, others and our environment. For example in punching or hitting others, or in swearing , or in throwing things…often through windows. When these occasions occur, it leaves the recipients, both adults and children scared and emotionally drained. Their security has gone. Very often the child perpetrating the violence is also left drained and usually full of remorse. They don’t always have the words to express their feelings and they certainly don’t always recognise that their stress levels are increasing to such an extent that they explode like a volcano. I was discussing anger management support strategies with an SFL teacher today and asked if they had a copy of ‘A Volcano In My Tummy’ by Whitehouse and Pudney. This is a classic book enabling teachers to support children in addressing their anger management issues. The problem is that the children who need this type of support usually run a mile from a worksheet, and although the book is full of great discussion ideas, everything is presented as a worksheet to complete. The whole volcano idea is excellent and I really believe it is a great metaphor that parallels the experiences of sudden disintegration of personal control and the consequent explosive power as shown in an eruption of anger. But how to make this metaphor more accessible to children? Create a model of a volcano using papier-mache. In the middle of the volcano plant a plastic tube, (like the ones that contain sterilisers for false teeth or even a baking powder pot.) Build the papier-mache around this and allow it dry. You can get really quite creative with this with the child. Take as long as you need and even build up a village around the base of the volcano perhaps even with a river or stream! This activity also throws up some wonderful sensory experiences when mixing the watery glue or wall paper paste with the paper and gently plastering the paper up. Finally paint the model, make some mini people and you have a lovely scene in which to play and act out role play. But back to how this can help us with anger management. Once the model is complete, you could introduce the child to a little experiment and discuss that we are a bit like volcanoes. When the pressure builds up we explode. Using vinegar and baking powder you can demonstrate the volcano (us…or more to the point the child!) in action. (You might like to cover the model in clingfilm first to avoid any upset over the model getting damaged.) You can talk about the ‘explosion’ and how it affects the people around us…maybe people in the village run away/get hurt by the lava/have their homes destroyed. This is all in metaphorical language and with support, the child will come to understand the consequences of their actions affecting everyone around them. Over time you can encourage the child to ‘play’ with the volcano and you can encourage the child to start using the volcano to ‘express’ their own anger or frustration as it is developing. By leaving some powder and vinegar around, they can add as much as they think they need for the explosion that is literally building inside them. They can learn to use the model volcano to explode their feelings before the reality of violent anger occurs. Understanding risk and when to take risks is an important skill that all children need to learn. It stands them in good stead for adulthood where we make constant judgements and assessments regarding the safety of an activity. This judgement can be to linked to physical, emotional, personal or even monetary activities. These risks may be as simple as crossing the road or as complex as deciding to marry someone or invest heavily in a new business. Playing during childhood is a constant rehearsal for adulthood and during play we see the adaptation of strategies in order for children to succeed as adults.If we prevent children from taking these risks, we are not allowing them to fully develop their skills before adulthood. The children need opportunities such as in this video of tonight’s excitement at Night OWLS! They need to jump off walls, to make sure they jump far enough away from the stone so as not to hit their heads. To make sure there are no other children jumping at the same time. To check the landing zone is relatively free of hazards and to ensure no other people are within flip zone of this wonderfully generous and bendy tree. Were the children were enjoying themselves and playing in their instinctively natural and spontaneous way? The children’s expressions and comments say it all. Check out the video on our facebook page, Outdoor Woodland Learning School. A FAIRLY WILD CAT SPOTTED IN BIRSE! What an awesome night yesterday at OWLS Club. The children were in the zone and very focused on their play. Ok, so it started to rain, but there is nothing like putting up a tarp shelter and lighting a fire to bring on the feeling of contentment and being enveloped by the deepening darkness. As we were heading back at the end of the session, the children ran off and hid in the darkness with the grown ups trying to spot them in the thick bracken with our torches. Oh, I do like reflective strips on kids jackets! I found one five year girl perfectly happy hiding in a dip in the ground. She was lying down in a damp patch of grass and looking up at the trees. (I would like to add she was also looking at the stars but that was more wishful thinking than reality last night.) No amount of persuasion would get the little girl to move and it was past our time to head down the hill back to the cars. The others walked on down to the bright headlights and I remained behind with the child. While I waited for her to get up and return with me to the cars, I switched off my torch and set myself to wait patiently in the darkness of the Aberdeenshire woods. At that moment, I heard a faint whisper and snuffle coming from nearby. At first I thought it was the girl climbing out of her hiding place but I was sorely mistaken. I stood still and held my breath. I heard the soft sound again, eerily reminiscent of a snow leopard! The sound came closer. Four paws on the ground creeping slowing towards me. The giant cat inched its way closer to me and I began to wonder about my fate, Would I be mauled by a giant cat in Birse or would it return quietly with me to the cars? In fact neither happened, something must have surprised the cat as it suddenly shot off down the hill at the speed of a hunting cheetah and was already belted into the car by the time I got down the hill. Now, the whole purpose of this post is not just the telling of a story, but in the recognition of why a particular strategy worked for a specific child at one moment in time. This is not about waving a magic wand a saying this technique will work every time we have a reluctant child not wanting to conform to our own particular expectations. (In this case of recognizing it was well past the time to head home and return to the cars with the rest of the group.) Metaphorically, by reaching out to the child at her level, and by entering into a world of fantasy (initially created by me by verbally suggesting that there might be a snow leopard hunting in the Birse woods) but taken on by her, enabled her to move from the position of being very mildly rebellious and testing out the opportunities and boundaries of defiance, to a position where she was happily able to return to her mum at the car park. Not a cross word spoken, not a frustrated leader in sight. Just a happy little girl who had transformed herself temporarily into a wild snow leopard creeping around in the woods. In supporting and educating children in the need to be more resilient, and in order to help prevent the complex mental health issues and extreme anxiety that I am seeing more of when working with youngsters, we need to enable children (and ourselves!) to learn how to fail. But not just learn that it is ok to to fail. The critical learning point is to pick yourself up and try again, and again and again, all the while constantly learning, adjusting and developing successful strategies. This happens a lot in the outdoor play environment. A child will try to light a fire using a striker and it takes practise…you don’t get instant results. You need to adjust the pressure on the striker, the angle of the strike, the type of tinder you use, the number of tiny sticks you add to build the fire and so on. Children implicitly learn resilience because they are extremely self motivated to succeed when they are playing outside in the woods at OWLS Club. We also see this in babies learning to sit up….picture a 6 month old wobbling as they sit on their bottom and then toppling forward or backward and hitting the floor. They don’t give up…they persevere. Imagine a 13 month old learning to walk and falling over and over and over again. As educators, perhaps we should be encouraging children to learn to fail, and then try again. Our teaching culture (particularly in maths) is very focused on success and getting the answers right. Perhaps we should be spending more time on enabling our youngsters to fail and then learn from their setbacks, for example in open-ended and enterprising problem solving. This would not only enable their maths skills to develop and consolidate, but also to develop their resilience and ability to pick themselves up after failure and try again. This afternoon I was asked to have a chat with a teacher about a particular child in their school. Some of you may know that last January I started doing some work with youngsters who were struggling with the whole primary school environment. One of the topics that came up in our conversation today was the need for children to develop the ability to risk assess their own activities. I have used this opportunity for self-guided learning both in a classroom context and also when working with individuals. As a class teacher, enabling a whole class to risk assess an outdoor, medieval cooking session opened my eyes to some of the benefits of children participating in group risk assessments. They worked out, through brainstorming together, who and what might be at risk and what these risks might be. They then had the chance to discuss how they might lower these potential risks to a more acceptable level. Once this was achieved we headed outside to do the cooking on a fire. It is so important we give our children opportunities to assess risk for themselves to develop personal resilience and avoid potential later mental health problems. Hospitals are observing now that fewer children are going to A&E with broken arms and legs, but so many more are now on waiting lists for mental health support. Perhaps there is a correlation?